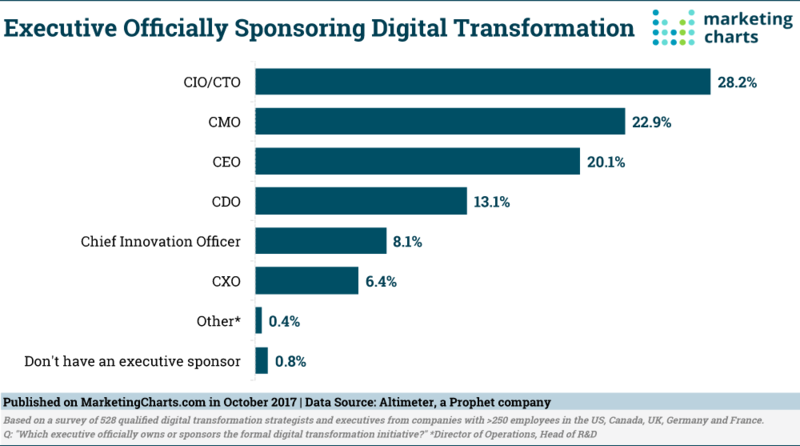 It's a common misconception that digital transformation is solely the integration or upgrading of technology in organizations, and therefore that its the responsibility of the Chief Technology Officer to drive the digital agenda. According to Dr Dave Chaffey, the digital transformation process should be broader, since it must provide a vision and roadmap of how digital media and technology can transform the customer experience of a brand and marketing communications across the customer lifecycle. The review of technology is imperative to driving a more integrated multichannel experience for both customer and employee, but its down to the senior management team to collectively agree on a roadmap and an experience for every customer, at every touch-point. Improving engagement through personal interaction between customers and employees should be the focus, it is then, where technology plays its part in augmenting that experience. It's a daunting task and one in which senior management need a clear understanding of where they are, and what needs to be achieved, along with complete cross-departmental alignment for the transformation process to be effective, so in essence, it is a collective effort, with collective responsibility. Unfortunately, 66% of companies say their leadership does not have a clear vision for the digital future. So when it comes to cross-departmental alignment, what are some of the most common barriers to digital reinvention? In our next free webinar for members, Benchmarking your digital future, Dave will be reviewing the state of digital transformation and recommending how companies at different stages of transformation, with different levels of maturity, can assess their current use of digital marketing, digital media and technology. An invitation to benchmark your digital future with an upcoming digital transformation webinar, presented by Dr. Dave Chaffey Digital Transformation is not just a buzz-word. It’s an important (if not absolutely essential) transformation process that every business needs in order …..